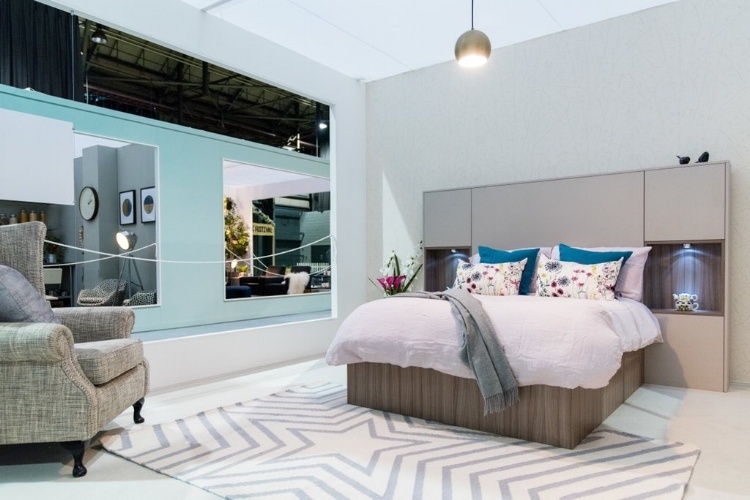 After working with Silvia of Casa Colori to produce her beautiful room set at the Ideal home show this year, we decided to work together on a little blog to provide you with some inspiration on how you can create a designer bedroom even when you don't have much space to work with. We all would like to live in a cosy and cheerful room with plenty of space to walk around, but most of the time rooms are too small and for those of us who are not designers, we might not feel confident enough to splash bold colour on the wall or to mix and match colourful furniture. We feel your bedroom should be the perfect space and even wrote a full guide on how to do this here. 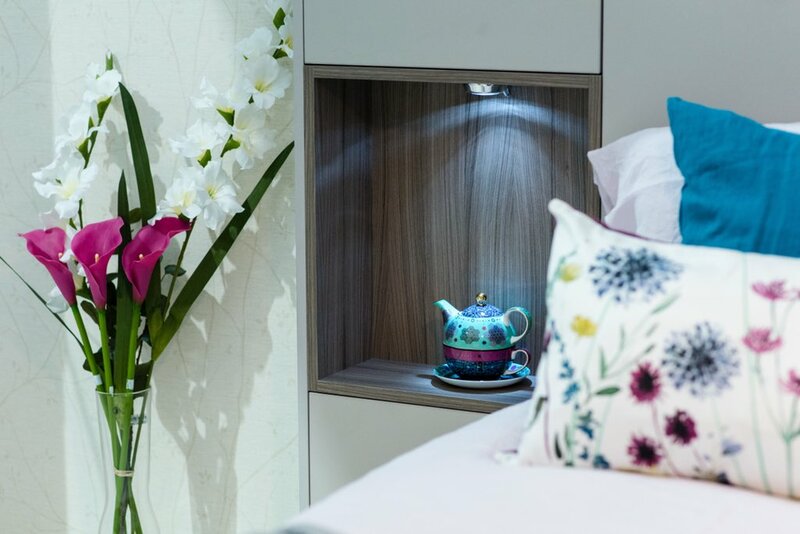 This room set by Silvia at the Ideal Home Show shows you how to create a vibrant room by making use of some carefully selected colourful accessories. "You could change the colour of accessories and artwork according to your mood; season and fashions. Many different colours can be used with the furniture showed here, however to use a light colour, like the pink I have used for the bed, as dominant colour, will allow you to use other darker colours to give some drama, like the teal cushions I have added on the bed." "If you want to use just one item as accent remember to use a bold dark colour; this really makes a statement against a neutral surface. Blue, red and emerald green are terrific against a creamy wall; red, pink, orange and blue are perfect with grey as neutral colour. When choosing the colours for your room try to use the colour chart so you have a better idea which colours go well together. However remember to keep the same colour scheme throughout the room; to create harmony." 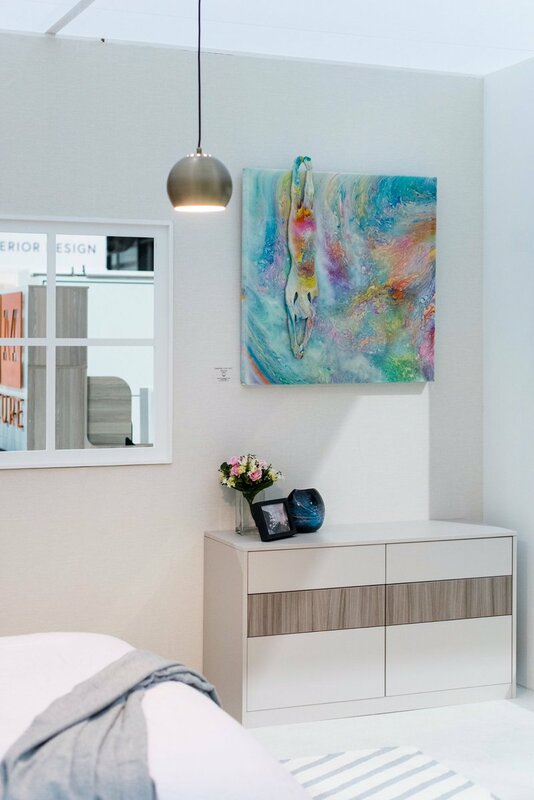 "With regards to a small room, DM Design furniture has many storage solutions in it to allow you to keep as many items as you require. Big furniture like the bed I used for the roomset will make your room appear more spacious than it is, but do not add too many pieces of furniture. Less is more in this situation, one big piece of furniture plus one or two small ones will be perfect for a small room." Some advice from our designers would be to go for fitted furniture when you have a small space. By doing this you can create the maximum amount of storage possible whilst using space that you may not have considered before. A good example of this would be the now back-in-fashion built-in bridging units above your bed. This is prime space that normally just lies open. Visit our Pinterest Board for some images of this in action. Another tip would be to go for sliding robes. These also make a space feel more spacious as you do not need to open the door up into your bedroom. From a design perspective, if you are ordering bespoke units, get a bit creative! Make use of different textures and colours like the ones we used on this set at the Ideal Home Show to create interest. By using Cashmere as the base colour and then adding some Coco Bolo wood as a strip on the cabinet as well as inside the hollows in the bed frame we created something totally unique that could flow through the room. To view our full range of sliding robes, why not pop into a showroom? How have you made use of colour and space in your home? Share your thoughts with us in the comments below!